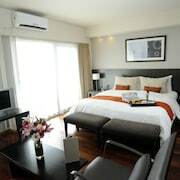 With a stay at Hotel Etoile, you'll be centrally located in Buenos Aires, steps from Recoleta Cemetery and Basilica of Our Lady of Pilar. 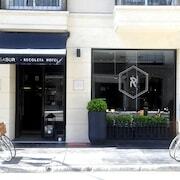 This spa hotel is close to Teatro Colon and Obelisco. 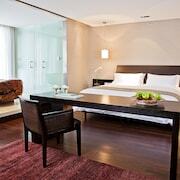 Make yourself at home in one of the 96 air-conditioned rooms featuring minibars and plasma televisions. Rooms have private furnished lanais. Complimentary wired and wireless Internet access keeps you connected, and cable programming provides entertainment. Private bathrooms with shower/tub combinations feature complimentary toiletries and bidets. Pamper yourself with a visit to the spa, which offers massages and body treatments. You can take advantage of recreational amenities such as a health club, an outdoor pool, and an indoor pool. 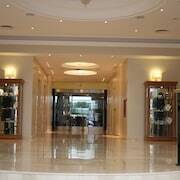 This hotel also features complimentary wireless Internet access, concierge services, and wedding services. Guests can catch a ride to nearby destinations on the area shuttle (surcharge). Grab a bite to eat at the hotel's restaurant, where you can enjoy drinks at a bar, take in a pool view, and even dine alfresco (weather permitting). You can also stay in and take advantage of 24-hour room service. Relax with your favorite drink at a bar/lounge or a poolside bar. A complimentary hot/cold buffet breakfast is served daily. Featured amenities include complimentary wired Internet access, a 24-hour business center, and limo/town car service. Planning an event in Buenos Aires? This hotel has 10495 square feet (975 square meters) of space consisting of a conference center and meeting rooms. A roundtrip airport shuttle is provided for a surcharge (available on request), and free self parking is available onsite.